An animated lunch and learn opportunity! 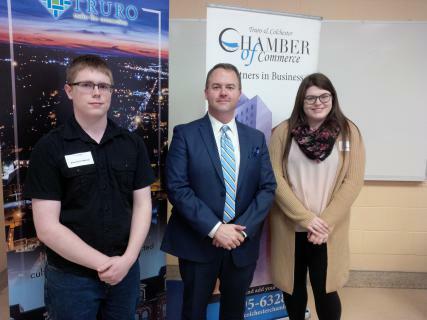 North Colchester High School student Sebastian Martell and Cobequid Educational Centre student Jessie Colburne recently participated in a lunch and learn put on by the Truro & Colchester Chamber at the Truro NSCC campus featuring Mike Johnson, President and CEO of REDSpace based in Bedford, NS. Mr. Johnson spoke to participants about the digital animation side of his business, as well as what it took to grow the company to more than 120 full time people while creating strategic and award-winning work for brands including Nickelodeon, MTV, Fox, Bravo, IBM, and Cartoon Network.